As much as I love cooking, I am not a fan of grocery shopping. I find the task to be tedious and mundane overall. Yet one grocery store holds an exception, and that place is Trader Joe’s. If you follow me on Instagram stories then you know I head here a lot! And every time I come home from a Trader Joe’s shopping trip, it makes for a very happy family. Walking into Trader Joe’s, I feel like I am heading into a neighborhood market where California meets Europe. Fresh flowers greet me on the right and fresh baked goods meet me on the left. It is a place where consistent favorites are on my shopping list, but I am always finding new ones to add with each shopping trip. It is always a happy place with enthusiastic employees (they are decked out in Hawaiian shirts after all!) and the price point on their items makes for an easy (on the wallet) grocery haul! What I probably love most though about Trader Joe’s, is the selection of products they offer. They offer items that are gluten free, kosher and vegan and almost everything there is organic. And I love that they offer new products with each season. The fact that it is a European company matters to me too. Europeans hold a higher standard to their food then we do. No matter what, I always feel I am buying great quality at Trader Joe’s. 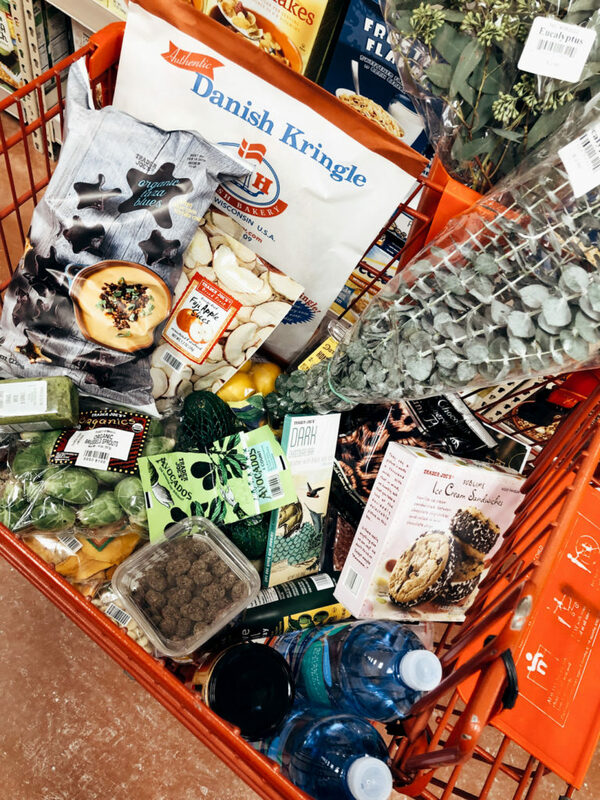 Before I move into sharing my grocery list favorites, I have a funny story about Trader Joe’s from the holiday season. I was checking out at Trader Joe’s in December and I was buying a couple boxes of holiday cookies. The clerk chuckled at the fact I was only buying two boxes as earlier that day a woman came in and bought over 20 boxes. And she wasn’t stockpiling them for herself. She was reselling the boxes on Ebay for four times the amount to people who did not have a Trader Joe’s in their area! Trader Joe’s definitely has cult level status! 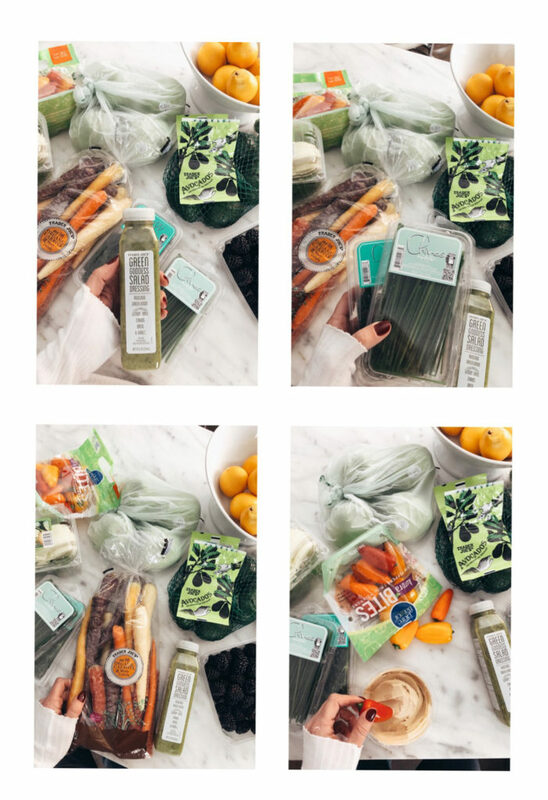 I could dedicate an entire post just to the produce section here. Fruit, vegetables, a great assortment of bagged and shredded greens, the list goes on and on. Here are the things on my grocery list though, that I pick up every time I am at Trader Joe’s. These are perfect for single serving. How many times do we only need to use 1/2 an avocado and then store the other half where it quickly browns up? I use these for avocado toast, on top of a salad or as a snack option with a dash of salt and a squeeze of lime! Cost: $2.99 for a 6 count bag! Meyer’s lemons are special because they are sweeter and less acidic then a regular lemon. They are perfect for cocktail garnishes and homemade lemonade but can replace a regular lemon in any recipe. They are not always easy to find so I snag them up every time I am at Trader Joe’s. Cost: $1.99 for a 1 pound bag! A green thumb I do not have so I am thankful that Trader Joe’s carries the best selection of fresh herbs. Every week I need some sort of herb for a recipe and I love that they are priced under $2.00. Cost: $1.79 each! I am always looking for an avocado fix! Introduce Green Goddess Dressing! With a heavenly hue and just 20 calories per 2 Tbsp. serving, this vegan dressing is packed with green ingredients (Hass avocados, basil, parsley, chives, etc. ), apple cider vinegar, & olive oil and perfect for adding to a salad or on top of grilled meats and vegetables. Cost: $3.69 for an 11 fluid ounce bottle! The mainstays of our pantry. I look to no where else to fill these needs! The best alternative to vegetable spray! Not only for coating pans, I sometimes will just use this as a substitute for salad dressing. A few sprays on lettuce with a dash of sea salt and the taste is so light and refreshing! Cost: $2.99 for 5 fluid ounces! Maybe Whole Foods can match the selection of dried fruit and nuts offered at Trader Joe’s but they will not beat the price! I love that there are plenty of offerings of no sugar added in the dried fruit and lots of raw options in the nuts. They are also plenty of great flavors too, making so many of the options perfect to have on hand for entertaining! Cost: varies but as an example, a 1 pound bag of sesame honey almonds is $7.49! This seasoning might just be my favorite item at Trader Joe’s! It will add the best flavor to even the blandest of foods. I add it to my scrambled eggs and slices of avocado. Cost: $1.99! After a work out, the body needs to restore it’s electrolytes! Luckily there are plenty of options of bottled water that add this in. Yet once again, the price point at Trader Joe’s makes this a winner! Cost: $1.49 for 1.5 liters! I never used to shop a frozen food aisle at the grocery store. 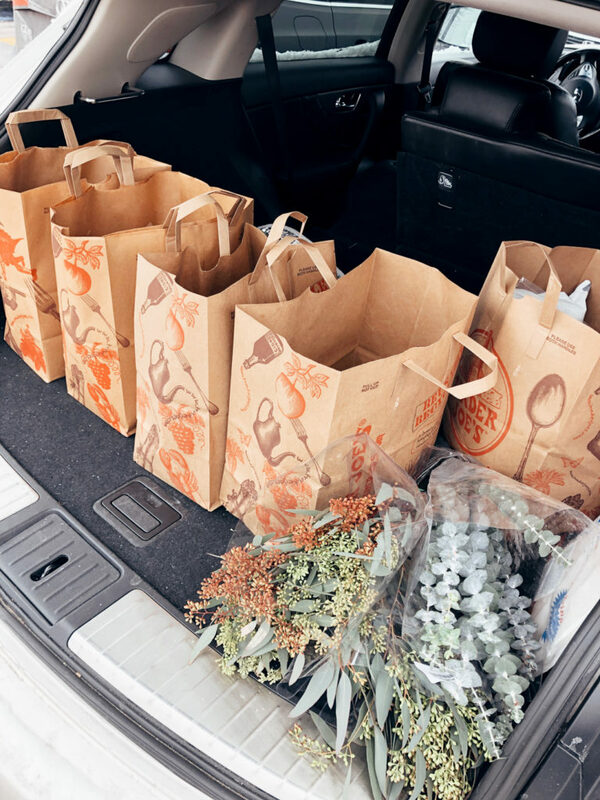 Insert Trader Joe’s and it is my favorite aisle to shop now! The cauliflower rice and fried rice are freezer staples. 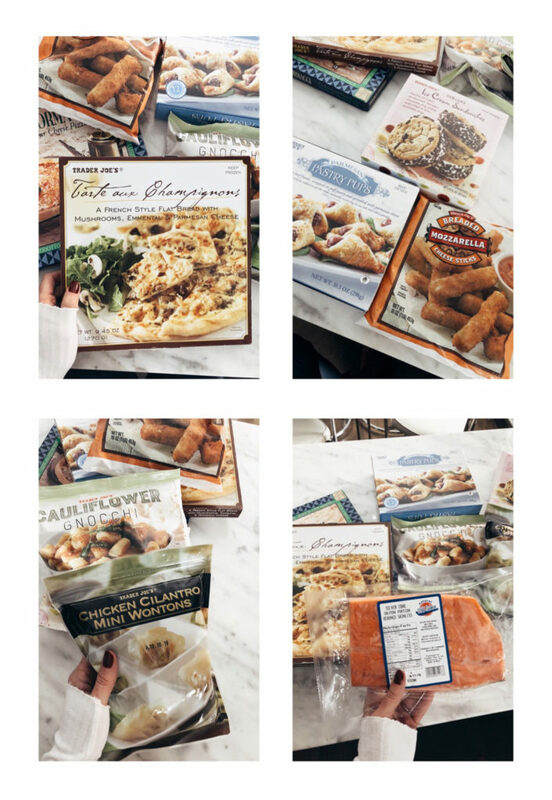 When my meal planning for the week is on the back burner or making a home cooked meal isn’t an option, I love opening up the freezer knowing that I will have something good from Trader Joe’s to feed the family with. The Orange Chicken is a family favorite but I am also happy with throwing in one of their pizzas too. Anything from a simple Margherita to a French Style Flatbread, I love the selection of pizzas from Trader Joe’s. Having a well stocked freezer filled with their pizzas makes last minute dinners, appetizers (hello mushroom and parmesan flatbread!) and afters school snacks an easy fix. Cost: varies but both featured here are $3.99! Besides pizzas, I love the freezer snack options to keep on hand as well, perfect for when we have a house full of kids. 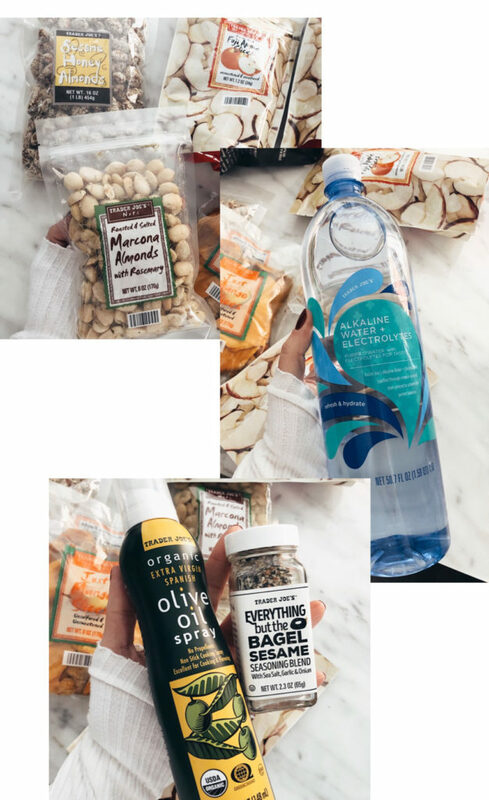 And because so many of Trader Joe’s products are often organic and made without unwanted preservatives and nitrates, I never feel guilty pulling these options out. The Mozzarella Sticks and Pastry Pups are two kid favorites! And for something sweet, we the love ice cream cookie sandwiches! Cost: varies but most are under $5.00! Fresh wild caught fish at the grocery store comes with an expensive price tag. Yet we all should consume fresh over farm raised. Trader Joe’s has a whole freezer section dedicated to sustainable, wild caught fish-salmon, cod and dover sole-all deboned and skinless. And what I would pay for farm raised per pound at the grocery store, is what I pay for such better quality fish at Trader Joe’s. Cost: $10.99 for 1 pound package of silver coho wild salmon! 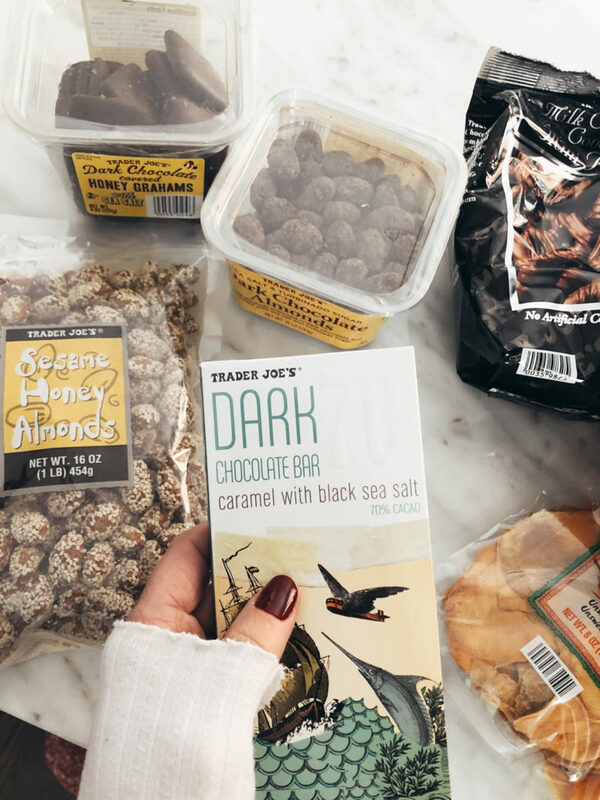 My heart starts racing when I head to the sweet’s section of Trader Joe’s! The selection of packaged chocolate, chocolate bars and cookies is hard to resist! And I rarely do! 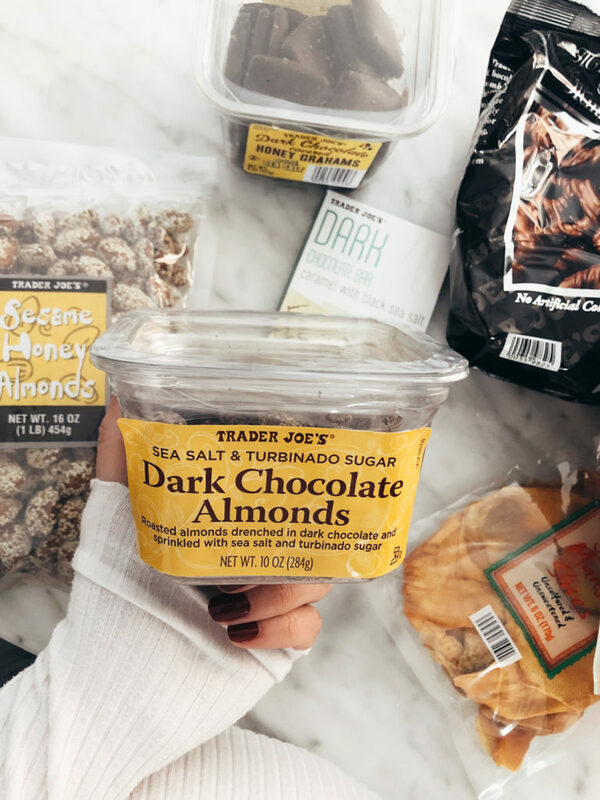 My absolute favorite are the Trader Joe’s Dark Chocolate Almonds with sea salt. They are the perfect mix of salty and sweet! Cost: $3.69 for a 10 ounce container! It took me awhile to start shopping this section of Trader Joe’s but now of course I am addicted to it! There are so many great beauty buys at such great price points! Essential oils, body scrubs, body butter, hand soaps to name a few! Below are some of my consistent favorites! 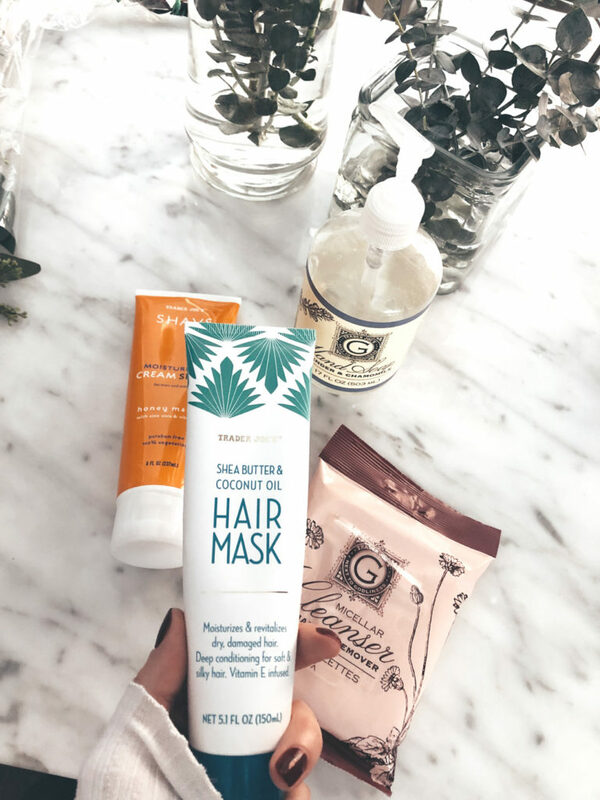 A winter staple and hair life saver, this mask is intensely moisturizing yet doesn’t weigh my hair down. I use it in place of a regular conditioner all winter long. Cost: $3.99 a tube! I fell in love with the packaging first so I added it to my cart! When applying, the film is thin but very moisturizing and soothing! Plus it smells like you are on a tropical vacation! Cost: $3.99 a tube but sells for twice that on Amazon! Whenever I am too lazy to take off my make-up or just want to freshen up my face, I use these wipes! They are soft, 100% natural fiber cloths that feature a hypoallergenic micellar cleansing solution.. Unlike other on-the-go cleansing wipes out there, these contain no alcohol, no colorants, no allergens and no parabens! Cost: $3.99 for a package of 20 towelettes! You know by now how much I love the flower section at Trader Joe’s! Anytime of year, it is worth adding them to your cart as most bouquets hover around the $3.99 mark! I am always blown away that every time I walk into a Trader Joe’s, fresh eucalyptus awaits me! It is the perfect green for winter. 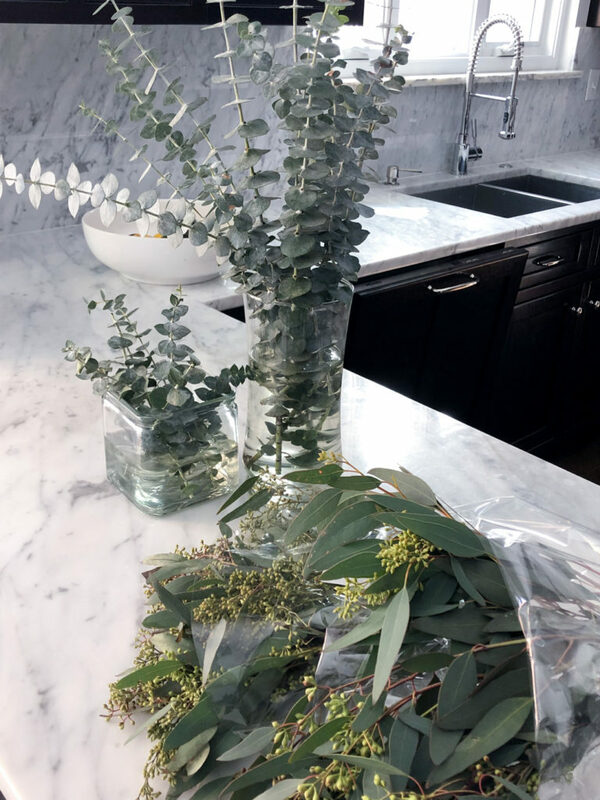 Beautiful as a filler flower or striking on its own, I love scattering eucalyptus throughout the house! Not only does it smell heavenly but eucalyptus has a long vase life too! And the best part is the price! Cost: $2.99 for 1 bunch! I ALWAYS love to hear from you! 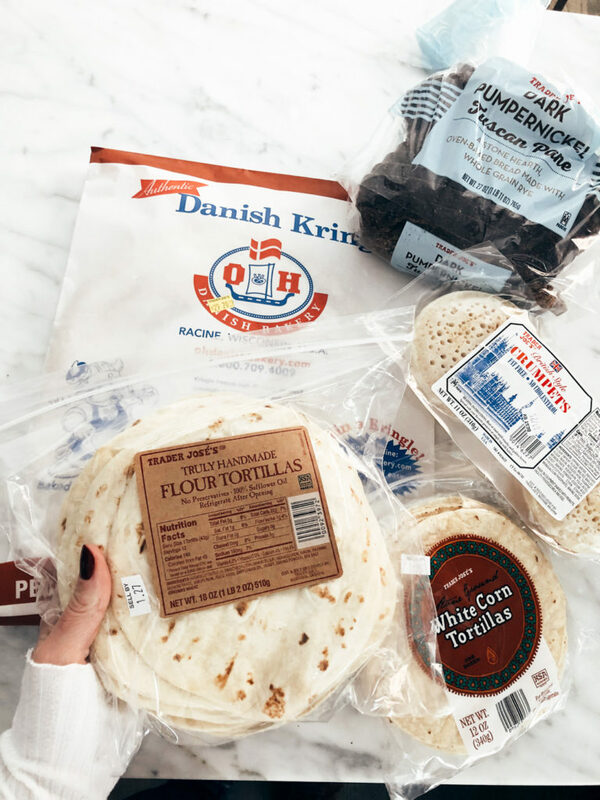 What are some of your favorite Trader Joe’s products and recipes? Please share by leaving a comment below!